symbolically underlies this Catholic-Maya church. streets with farmers, vendors, artisans, and tourists. resin holy brothers burn and swing in tin-can censers. From fragrant clouds comes an old man in a gray suit. stand paired to the radiant faces for weddings. until He, too, in His love for the people, steps down. Kathleen S. Burgess is a senior editor at Pudding Magazine: The Journal of Applied Poetry, editor of Reeds and Rushes—Pitch, Buzz, and Hum (Pudding House), and author of Shaping What Was Left (Pudding House), Gardening with Wallace Stevens (Moria Books), The Wonder Cupboard (NightBallet Press, 2019), and the October, 2018 poetry memoir of a year hitchhiking to South America, What Burden Do Those Trains Bear Away (Bottom Dog Press). 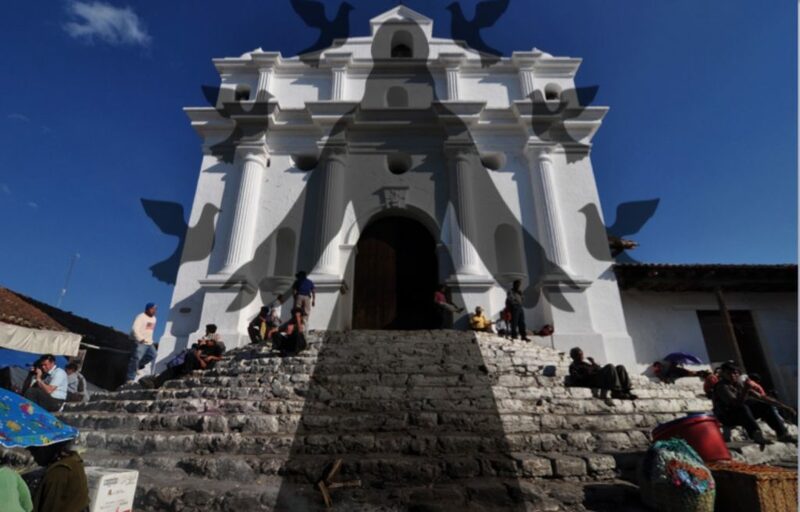 Editor’s Note: The image is of Iglesia de Santo Tomás in Chichicastenango Guatemala with a Jesus Christ silhouette. According to Wikipedia, the church was built around 1545 on a Pre-Columbian temple platform, and the steps originally leading to a temple of the pre-Hispanic Maya civilization remain venerated. K’iche’ Maya priests still use the church for their rituals, burning incense and candles. Each of the 18 stairs that lead up to the church stands for one month of the Maya calendar year.